Well, that’s another year done and dusted. As we move forward to 2017 we thought we’d have a review of the highs and lows of the teams we’ve been covering on the Front Row Union. It’s been a mixed year for the teams we covered on the Front Row Union. I’m pleased to say that the win percentage has been higher than the losses as you can see from the table below. Ireland marked their calendar year with wins against New Zealand, South Africa and Australia making it one of unprecedented results. However, they also lost to New Zealand, South Africa (twice), England and France. While some major achievements were ticked off, it’s yet to be determined if their achievements were more through circumstance than judgement. We all thoroughly enjoyed the win against the All Blacks but their failure to push on against a disintegrating South Africa in their Summer series was a huge disappointment. They have shown they can lift their game for one big match but two in a row still appears to be beyond them. However the Men’s results were substantially better than the Women’s whose only wins were against Wales, Scotland and Italy. They did however set themselves high targets this season with a series against the top three teams in the World in New Zealand, England and Canada. However the nature of the defeats against New Zealand and Canada were particularly disappointing. The gradual thinning of the 2013 Grand Slam winning team is starting to take effect and so far Ireland have failed to bring in players of the required caliber. They are there, but the fitness and basic skills are a long way short of what’s required if they are to recapture past glories. The Ireland Women’s Sevens results have to be a huge disappointment given the amount of money spent on this programme. Take away their six results against the also rans of the Olympic Repechage and their win percentage drops to 28% which is a disgrace for a professional team. It wouldn’t be tolerated in the Men’s game and it’s disappointing it’s seldom questioned in the Women’s . The hand’s of Anthony Eddy and David Nucifora hang heavy on the Women’s game but they don’t appear to have the answers or accountability? There was one Ireland team that shone on the International Stage, and that was the Ireland U20’s. It was a slow start with back to back defeats to Wales and France in the Six Nations but even then they were playing lovely rugby. They got the breaks and strung together a run of seven wins, beating England, Scotland and Italy in the Six Nations followed by Wales, New Zealand, Georgia and Argentina in their run to the 2016 World Rugby U20 Championship Final. Unfortunately they lost that one to a strong England side but what joy they gave us in Manchester throughout June as they reached their highest ever seeding, playing some real heads up rugby on the way. 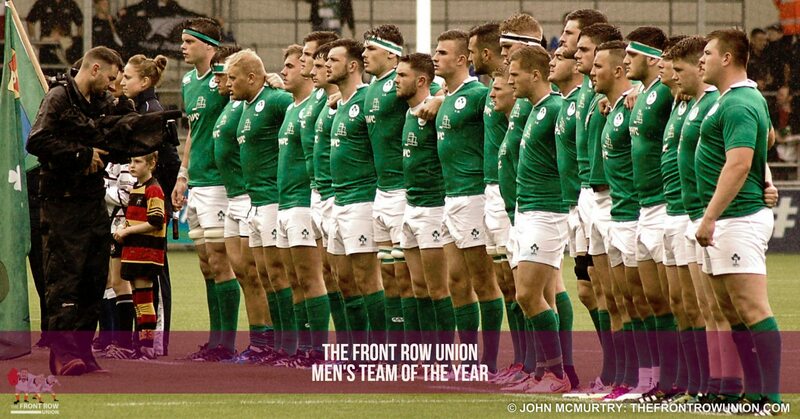 A seventy percent win ratio cannot be ignored and the Ireland U20’s are by some stretch the Front Row Union Men’s Team of the Year. Exclusive pictures of Ireland U20’s 2016 World Rugby U20 Championship here. It was a mixed year for the senior men at Ulster Rugby though, depending on your expectations, it’s been a year of marking time. The year didn’t get off to the best of starts with the senior team losing to Munster, in the PRO12 and Saracens in the European Cup but, their season was typified by their narrow win against Oyonnax in the rearranged European fixture. A performance that cost them their place in the knockout stages of the European competition. A desperately poor performance in the first half against the French outfit left Ulster chasing a 23 point deficit in the second. They did come back to win the match by a point but they failed to secure the try bonus; a result that saw them lose out to Northampton for that play off place. Ulster did rebound to secure a Top Four finish in the PRO12 but lost to Leinster in the semi final for another year without silverware. Ominously they finished the year with another lackluster performance at the RDS. Time for change? January was also a telling month for the A team. Losses to Bedford Blues and Bristol Rugby saw them drop out of the British and Irish Cup, but, there has been much improvement this season. Wins against Jersey, a double against Cardiff Blues PS and a double bonus point defeat away to London Scottish sees them leading their Pool in this season’s competition. If they push on they could be in the running for the team of the year 2017. Ulster Women continued to rebuild but it was the fifth year on the trot without an Interprovincial Series win. They did win a friendly against Connacht early in the season. The players are struggling to recover from years of indifference from the Ulster Branch and are the most underfunded provincial side in Ireland. Ulster Rugby seem happy to promote the legacy of the 2017 Women’s Rugby World Cup, and make a few bob in the process. Their real legacy is seven years of neglect of the Women’s game. Shame! Our shining stars of the Women’s game in Ulster are of course the Ulster Women’s U18’s side. Like the Ireland U20’s they played with their heads up and completely dominated the Interprovincial Series. There were plenty of bumps along the way, against quality opposition. This magnificent team refused to be beat and they chased down every lost cause to break the will of their opponents. 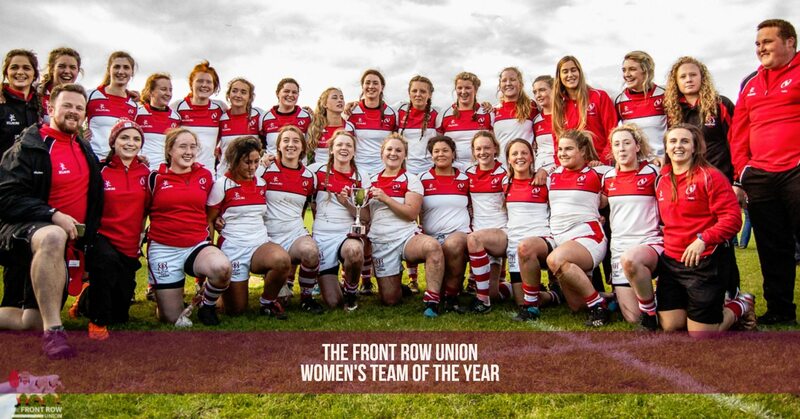 They were fantastic and are the Front Row Union Women’s Team of the Year. Exclusive pictures of the Ulster Women U18’s Interprovincial Campaign here. That’s a wrap for 2016. Thanks to the U20’s and the U18’s for bringing us so much joy in the last year. We look forward to covering your progress in 2017.